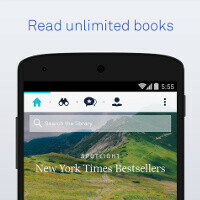 Bookworms, take notice - the all-you-can-eat, Spotify-like service for books, Oyster, with its catalog of over 500,000 titles, has arrived on Android. Oyster brings a free companion app to its subscription service, but the subscription itself is paid - it costs $10 a month to get access to that huge book library. Just like Spotify and other popular all-you-can-eat subscription services, Oyster also comes with a recommendation engine that would suggest new titles and authors to check out. The serivce promises to add new books every week, plus it has New York Times best-sellers and a special selection of Oprah-approved titles. The only downside to all this book joy is that Oyster is currently only available in the United States. For all other countries across the globe, the traditional pay-per-book services are the only other option right now.